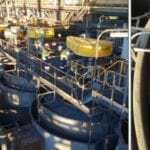 New Century Resources has commenced stockpiling of zinc concentrate in the company’s 80,000t capacity Karumba Port storage shed, representing the first utilisation of the facility since the Century zinc mine was put on care and maintenance in 2016. 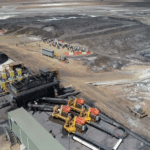 This confirms the operational suitability of the company’s 304km concentrate slurry pipeline in transporting concentrate from the Lawn Hill mine site to the port, according to a statement from New Century. 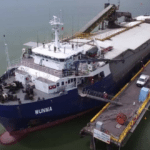 Concentrate from the storage shed was loaded via conveyors directly onto the company’s transhipment vessel MV Wunma for exports. 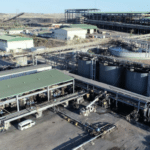 Commenting on the restart of Karumba operations, New Century port manager Greg O’Shea said, “The successful refurbishment and restart of activities at New Century’s port facility is a great achievement for the company and an exciting development for the town of Karumba. New Century anticipates exports of 300,000–400,000 tonnes per year (t/y) over a six-and-a-half year mine life via the port. This achievement puts New Century on track to receive its revenue from the sales of concentrate in the third quarter (Q3) of 2018. During the December 2017 quarter, New Century launched a tender for 1.5 million tonnes (Mt) of zinc concentrate for the first 3.5 years of production. Around half of this total is covered by the company’s offtake agreements with Mercuria Energy Trading and Transamine Trading SA.